With this tasting, I’ve caught up with my advent schedule. 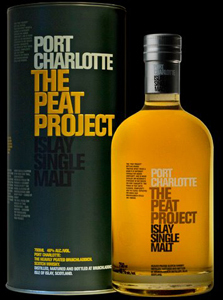 This is the entry-level unpeated offering from Bruichladdich and one that I’ve heard a lot of good stuff about. 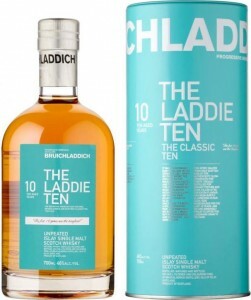 The Laddie Ten pours golden yellow. Although unpeated, it’s got a definite briny smoke on the nose along with the sweetness of vanilla and honey. It’s a pleasure to sniff the lightly smoky sweet aroma and pick out the fresh cut grass, spicy ginger and pepper, fruity plum and pear with a nice balance between all of them. You still get an image of a grassy island surrounded by seawater. Moving on to the taste, it’s distinctly Islay with less brine than the nose would suggest, but the sweetness remains: apple, vanilla, honey and sweet lemon. There’s also the mild woody smoke as well as white pepper that carry through to the finish, which is long and mostly dry, woody and leathery after the last of the tart fruits fade. This is a mild Islay and not at all like the oily experience of a Laphroaig, Ardbeg or Bruichladdich’s Port Charlotte offerings. It makes for a good introduction to the style because it has plenty of characteristic Islay attributes without the intensity that Islay lovers adore. Give it a try! Posted in Whiskey. Tagged Bruichladdich, Islay, Single Malt. Thanks to Mark E. for this sample! The color is a pale yellow. 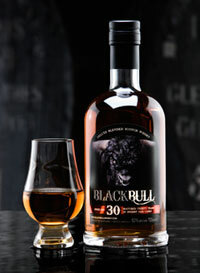 On the nose, there’s plenty of sweet, peaty smoke with grapefruit, toffee, vanilla and a bit of ginger in the background. Giving it time to breathe tames the smoke a bit, although it wasn’t overpowering before, and reveals a soft grassy aroma with just a touch of honey. This is a very enjoyable whisky to breathe in. 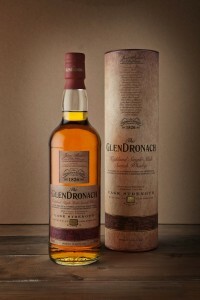 The taste is at first sweet, then turns immediately to soft smoke and peat. The next wave brings a salty collection of fruit and spice with a chewy leathery texture entering next. The finish is leathery charred oak, smoke and white pepper as the sweetness lingers and fades along with the salt and peat. That salty, peaty taste returns again as the wood and smoke diminish. The sweet flavors are butterscotch, honey and vanilla with a generous ginger and black pepper bite. The fruity flavors are grapefruit, orange and peach. There’s a lot of flavor here and I like it all the way to the finish, where there’s a bit too much bitterness to balance with the other flavors. The smoke becomes a bit more prominent with time. A splash of water restores some balance as it enhances the fruit, subdued the spices and cleans up the oak tannin. Even the smoke moves to the background a bit. 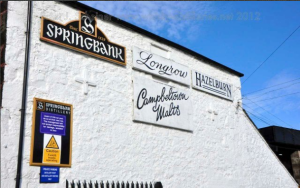 Although this whisky is not for me, it is very good and should appeal to Laphroaig fans who want something a bit less bold.